On March 3, 2015, the North American Wood Ape Conservancy released the Ouachita Project Monograph (OPM), a 213-page work detailing four years of research by NAWAC members in the Ouachita Mountains Eco-region of southeast Oklahoma. In all, NAWAC personnel spent 12,000 man-hours in the field between 2011-2014. The observations and experiences of these men and women were meticulously detailed in journals and field notes. The OPM is a collection of the more notable thoughts, experiences and impressions recorded by scores of NAWAC team members who spent between 1-2 weeks at a time in the study area known as Area X. The OPM has received criticism from some people who claim that the experiences related by NAWAC members are simply too fantastic to be believed. Some of the criticism comes from people who have, rather obviously, not taken the time to actually read the OPM while others dismiss everything in the work based simply on their belief that wood apes do not exist. In the minds of these critics, if there is no such animal, everything in the OPM must be false. My intention in this series is simple. I plan on breaking the OPM down into small sections – focusing on one observed behavior at a time – and attempt to point out that what has been described is really not that outlandish and, in fact, fits in nicely with behaviors exhibited by the known great apes. My hope is that these posts will intrigue those who have not taken time to read the OPM enough to do so as the behaviors discussed are explored in infinitely more detail in the actual monograph. The observed behavior I will focus on in this post is rock throwing. 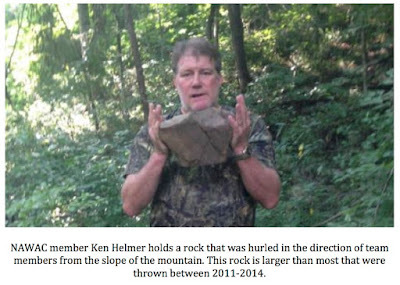 From the time the first teams of investigators arrived at the main study area in June of 2011 through the departure of the final team in September of 2014, observations and documentation of rock throwing was almost constant. Every team that was deployed - who each stayed on site for a minimum of 7 days - recorded rock throws. Some teams observed more of this activity than others but no team, to my knowledge, failed to record fewer than a dozen rock impacts during their stay, mostly caused by projectiles ranging in size from a quarter to a baseball. Some teams documented in excess of 100 rocks being thrown during their week in the study site. Some of the rocks were directly observed by team members flying through the air before striking the roof of the cabin or a satellite structure or landing on the ground right beside them. Other team members saw rocks whiz through the air directly in front of them as they hiked or, after hearing a loud impact on the cabin or shed, watched a rock roll down from the corrugated metal roof and land virtually at their feet. Rocks do not simply fly through the air on their own and the physical location of the main cabin and its satellite structures made it impossible for any dislodged rocks to roll down the slope through the incredibly dense foliage of the nearby mountain and land on the roof. NAWAC investigators conducted multiple experiments in an effort to see if rolling rocks coming down the mountain could, indeed, reach the roofs of the structures in camp. They were simply unable to get any rocks that were manually dislodged to get anywhere near the cabin as their momentum was always stopped by trees or brush prior to reaching the building. The handful of dislodged rocks that did manage to roll through and clear the brush all rolled to a stop short of the cabin itself and never came anywhere close to reaching the base of the structure, much less the roof, as the cabin is not sitting directly under any sort of cliff or overhang. The only rocks that reached the cabin roof during these experiments were those that were purposefully thrown in an overhand manner by team members. Even using an overhand throwing motion, it proved difficult for NAWAC members to reach the cabin roof from more than 20-25 yards away due to the incredibly dense foliage and forest canopy. The experiments satisfied the NAWAC that rocks were purposefully, and willfully, being thrown at the cabin either from close range or by an entity strong enough to remain at a safe distance and hurl the projectile with enough force to penetrate the foliage and strike the cabin or a satellite structure. The sheer number of rock-throwing incidents would also seem to eliminate dislodged rocks as the explanation for these impacts. Rocks do not decide to come loose and fling themselves into the air. 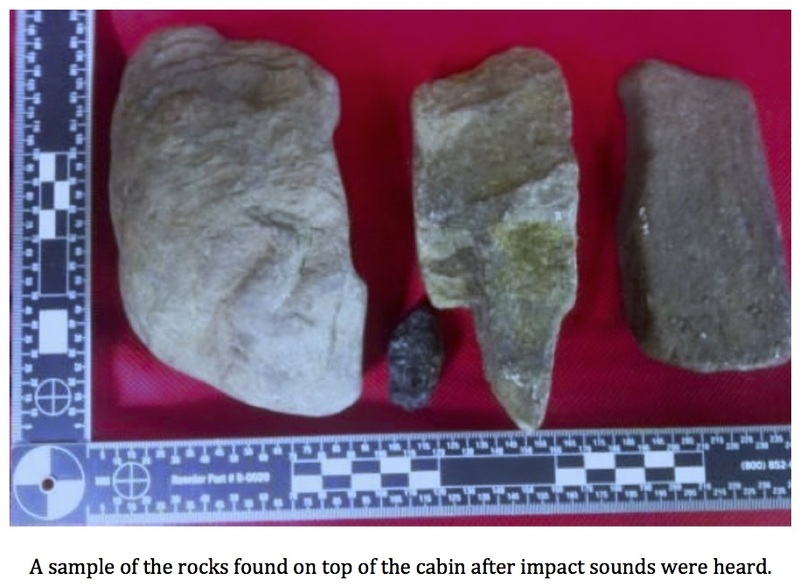 Rocks dislodged by animals or erosion would not occur in the numbers documented and, as mentioned previously, could not have reached the roofs of the cabin structures even if they had. 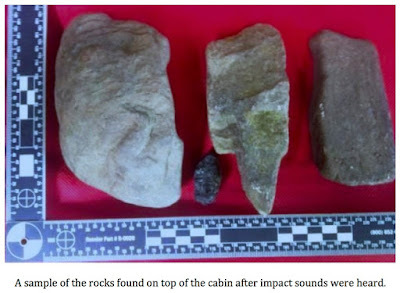 Too, the high number of rock impacts seems to have caused some people to doubt that wood apes could be responsible or that the incidents occurred at all. I can assure you that the rock-throwing incidents did occur but understand the question of whether or not something, or someone, else besides wood apes could be responsible. Let us look at who, or what, native to the area, could possibly be responsible for these rock-throwing incidents. To be sure, the number of possible suspects is extremely limited. Suspect 1 – Black Bears: Bears do not throw rocks, period. It is possible that a bear could dislodge and roll a rock while foraging for food but, as noted above, the rocks thrown were, for the most part, quarter to baseball-sized. These smaller rocks simply could not roll down the heavily wooded slope and reach the cabin roof. Bears are certainly strong enough to flip and roll larger rocks but larger projectiles were rarely observed and, certainly, nobody would attempt to cogently argue that a black bear picked up and threw, tossed or flipped a basketball-sized rock with enough force that it cleared all of the foliage between the top of and base of the mountain in order to strike the roof of a structure or whiz by the face of an investigator. In my mind, black bears are out. Suspect 2 - Squirrels, raccoons and/or other small mammals: Squirrels will occasionally drop nuts or objects onto tents or even passers by but these projectiles always fall straight down. NAWAC team members have directly observed rocks and other projectiles, like tree limbs, flying through the air in a horizontal fashion. Squirrels lack the dexterity and strength to manage such a feat. The same could be said for raccoons. Though the paws of a raccoon are incredibly dexterous and “hand-like,” the most they could possibly manage would be to toss small pebbles in an underhanded motion. It is simply not feasible to think squirrels or raccoons are responsible for the rock throws recorded by NAWAC observers in Area X. Suspect 3 – Humans: On the surface, this explanation seems to be the most plausible. After all, it does take hands to throw rocks and other objects. Could the NAWAC members be the victims of a hoax? Could humans be responsible for the rock throwing incidents documented in the study area? For various reasons, my opinion is no, humans are not, and could not be, responsible for the rock throwing incidents documented in the OPM. Certainly, humans are physically capable of such an act, no one is arguing that point; however, once the entire picture is taken into account – and to do so, one must actually read the entire OPM – it should become clear to all but the most unreasonable of skeptics that human intervention is, at best, extremely unlikely if not impossible. Area X is miles from the nearest human habitation. Miles. It is amazingly difficult to find the study site, as the road in to the area does not appear on maps. Actually, calling the way in a road is generous. The path is incredibly rough and treacherous and numerous NAWAC members have suffered multiple flats and vehicle damage as a result of attempting to traverse it. I, myself, have left parts of my truck somewhere along that brutal road to go along with multiple incidents of tire and body damage. Nobody with any sense would travel that road for any length of time unless they knew exactly where they were going. The area itself is heavily forested and filled with all manner of dangerous wildlife. Ticks, canebrake rattlesnakes, cottonmouths, mountain lions and black bears roam the area and have, on more than one occasion, caused NAWAC members some anxious moments. The terrain is heavily wooded with amazingly dense underbrush. Thorny plants and poison ivy are rampant. In addition, the area is easily the rockiest place I have ever seen. I have never been anywhere where just walking was so difficult and treacherous. The area receives 50+ inches of rain per year and downpours are not uncommon even in summer months. The heat and humidity become very difficult to tolerate and only the most hardy and determined of people would make a conscious decision to stay there even with a full compliment of camping gear. The idea that a person, or multiple people, would sit out in such an environment for weeks on end, without setting up some kind of camp, to torment NAWAC members with thrown rocks at all hours of the day and night is absolutely laughable. Suspect 4 – Wood apes: The NAWAC’s hypothesis is that wood apes, or sasquatches, are responsible for the rock throwing incidents documented in the OPM. 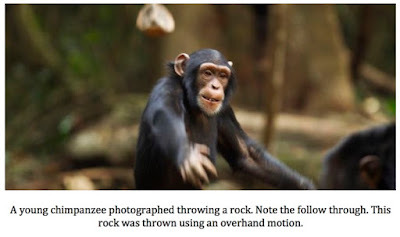 When the rock throwing incidents are considered in context with other unusual observations documented by members, including, but not limited to, wood knocks, mumbling faux speech, howls, powerful smells, loud bangs and/or slaps on metal/structures and, finally, visuals of an agile, hair-covered and bipedal animal, the wood ape hypothesis does not seem so incredible. Further, when the documented behaviors are compared to known behaviors observed in the great apes of Asia and Africa, they seem less fantastic still. In my opinion, a point has been reached where the explanations offered by skeptics of possible hoax scenarios are more fanciful and unlikely than the possibility that there is an undocumented animal in the region. Following are excerpts from the OPM detailing some of the more notable incidents of rock throwing observed my NAWAC members. On the night of May 10th and into the early morning hours of May 11th, 2012, a team of NAWAC investigators made up of Daryl Colyer, Rick Hayes, Ken Helmer and Paul Bowman experienced several strange events and heard multiple odd noises/vocalizations. The highlight of the night, however, was the exchange of thrown rocks between the team and an unknown assailant perched somewhere on the mountain slope to the N-NW. The incident became known as the “rock war” among NAWAC members. Between the hours of 7:44 p.m on the 10th and 2:30 a.m. on the 11th, the men heard multiple rock impacts on the cabin and its satellite structures, heard rocks or other projectiles crashing through the dense foliage of the mountain slope, saw, heard and felt rock impacts in their immediate vicinity and heard strange vocalizations including an “OOOOO” sound, faint “chatter” and, off and on, smelled a powerful equine-like odor similar to what might be encountered in a horse stall. While most rock throws experienced by the group are believed to have originated from a spot close to camp or to the members (20-50 yards), more than once, NAWAC investigators reported rock throws that are estimated to have carried amazing distances. One such incident, which occurred on July 3, 2013 and recorded in the OPM, follows. 4:33 a.m. – McAndrews and Horstman heard what they first believed were independent wood knocks, but then realized they had heard one single object (a rock) thrown from the east to the west along the slope of the mountain. The rock apparently struck wood four times before it succumbed to gravity and fell to the earth, perhaps, providing the final knock sound. McAndrews and Horstman were in disbelief when they realized that the object had been thrown an estimated 100 yards along the slope of the mountain. 4:53 a.m. – Another rock was thrown and landed somewhere to the east in the bottleneck area. After that, many rocks were launched. It seemed that rocks were flying in every direction. The men found it was impossible to document them all. McAndrews and Horstman wondered if the rocks were part of some kind of hunting activity. 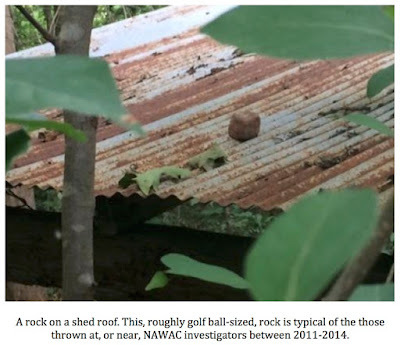 Over the four-year survey period, NAWAC teams physically collected over 60 rocks from the roofs of the base cabin or other roofed structures on the property. The rocks varied in size and shape and were, on average, golf ball to baseball-sized. Other incidents, while less spectacular than the first two noted here, are considered just as significant by the group. One such incident is recorded below and shows that rock throws did not take place only in close proximity to the base camp cabin and satellite structures, which are all situated reasonably close to the base of the mountain, but also in flatter areas some distance away from any kind of slope. The incident is taken from the after-action report of Operation Persistence Team Delta of May 26, 2012. 4:30 p.m. – Daryl Colyer and Travis Lawrence deployed in the ghost blinds to the south side of the creek bank on relatively flat, but rocky, ground. 5:30 p.m. – The first of several rocks landed just below where Lawrence and Colyer were deployed. The rock was baseball-sized and landed a few feet from Lawrence. It hit the rocks below him and loudly bounced around. Colyer and Lawrence exchanged rock throws over the next half hour with the unseen rock thrower to their E-NE. The culprit was concealed behind a wall of dense vegetation and forest debris. Individual members seem to have been targeted by unseen rock throwers, two of whom were actually struck by projectiles. Paul Bowman, Kathy Strain, Travis Lawrence, Jerry Hestand and Mark McClurken were all buzzed very closely by rocks – within inches or a few feet- or, in the case of Baron Meadows, actually struck on his boot, during the summer of 2013. 11:01 p.m. – As Hayes walked around the cabin toward the fire circle, a rock popped the base camp cabin roof. 11:03 p.m. – Another rock, seemingly thrown from the mountain slope, landed on the ground between Strain and Hayes. 11:30 p.m. – As Hestand stood by the east shed, a rock loudly blasted the roof of the shed, greatly startling him. He believed the rock had been intended for him. The incidents shared previously are but a few that are documented in the OPM. While incredible in their own right, these incidents are far from unique. Native Americans have long believed wood apes throw stones and sticks in order to drive human interlopers away from their locations. John Bindernagel refers to once such report in his book North America’s Great Ape: The Sasquatch. Bindernagel also recalls a recollection of John Green in Chapter 15 of his tome. Bindernagel believes that the throwing of rocks by wood apes can be almost benign in nature, maybe no more than an attempt to elicit a response of some sort from an interesting human. In some cases the hurling of stones may be a way to deter people from entering or occupying an area without the need for more aggressive displays. To illustrate one of the more benign incidents, Bindernagel recounted the experience of a mechanic on southwestern Vancouver Island in his book. Bindernagel also shares a few accounts where the rock-throwing intensity seems to have been taken up a notch and is an attempt to intimidate or frighten humans into leaving an area. The following incidents, recounted in America’s Great Ape: The Sasquatch, highlight this behavior. The accounts above are all relatively recent; however, reports of rock throwing wood apes go back much farther in time. Bindernagel mentions these in Chapter 15 of his book as well. Perhaps, the most famous rock-throwing incident in sasquatch lore is the tale of what happened to Fred Beck and his group of prospectors in 1924 in Washington’s Ape Canyon. 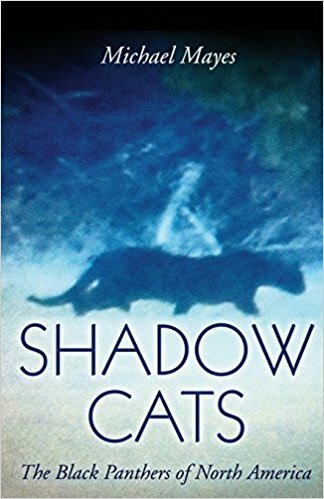 The story is quite well known so I will not recount it in much detail here. Basically, Beck and his party were prospecting when one of his men spotted a wood ape and took a shot at it, apparently hitting it. That night the cabin in which the men were staying came under “attack.” The intensity of the attack has been the subject of much debate and, no doubt, been sensationalized over the years. Beck, himself, refuted many of the newspaper accounts in which it was written that large boulders slammed the cabin walls. He did, however, concede that many smaller ones (rocks) were hurled at the cabin. “They did not break through the roof but hit with a bang before rolling off,” he said. 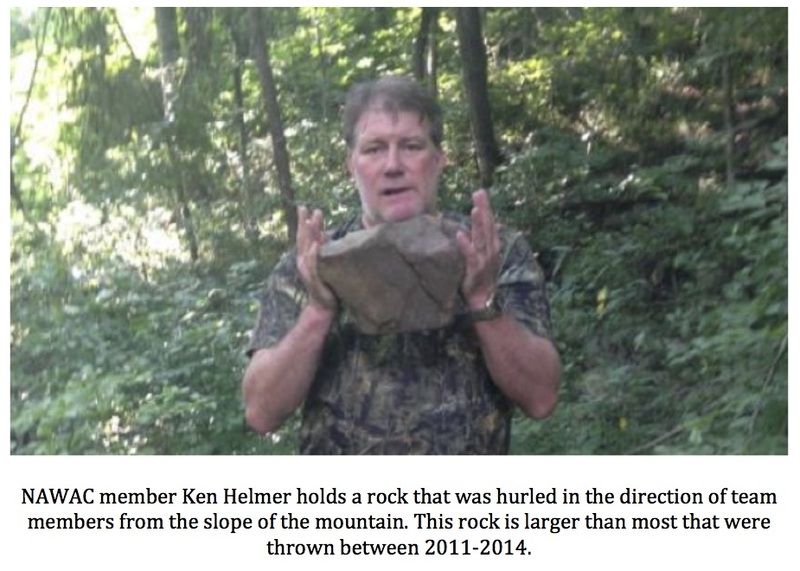 Another modern account of rock-throwing comes from none other than Dr. Jeff Meldrum, a figure widely known by those interested in the wood ape mystery. 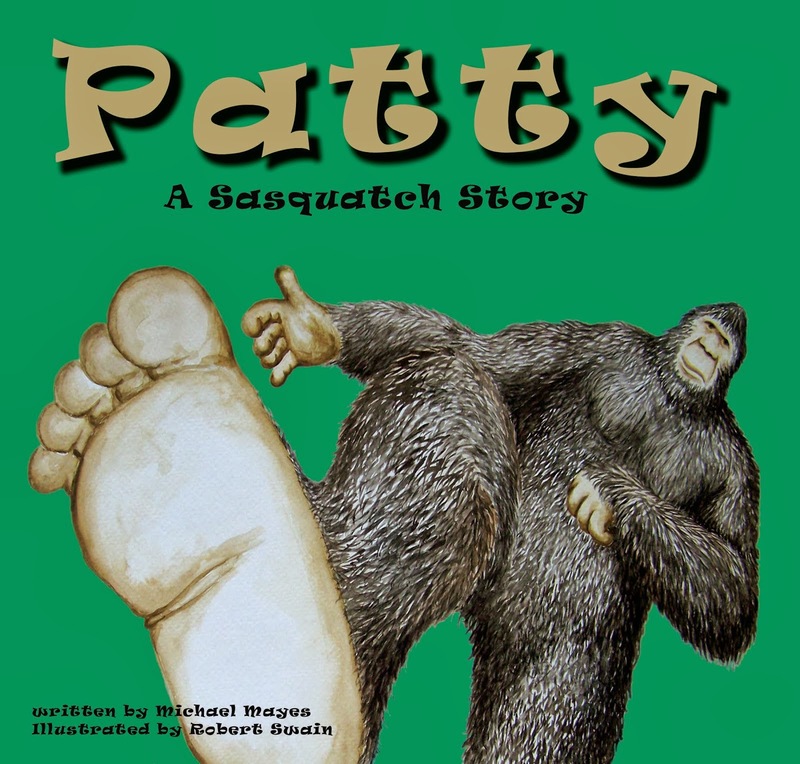 The following account comes from the introduction of his book Sasquatch: Legend Meets Science. To set the scene, Meldrum and a party were conducting fieldwork in the Siskiyou Wilderness in Northern California. While revisiting a ridgeline where some intriguing tracks had been found earlier in the trip, Meldrum had an interested encounter. It should now be established that the accounts of rock-throwing documented by NAWAC members in the OPM are not unique. Similar accounts have been recorded from different locales going back for decades or, in the case of the Native Americans, centuries. The question now becomes, are there any precedents for this type of behavior among known animals, the great apes in particular? The answer is a resounding yes. This rock-throwing behavior has also been observed in captivity. According to a 2009 article in the journal Current Biology, a chimpanzee named Santino routinely collected rocks, cached them and then waited until zoo visitors approached his enclosure. Once visitors were within range, Santino would hurl the rocks at them in an effort to shoo them away. Santino’s behavior proves that one of the known great ape species can, and does, throw rocks when aggravated. Even more compelling, it hints at cognitive capabilities greater than we might have imagined in an ape. Santino always collected his rocks during periods of calm before zoo visitors arrived. He stashed them away until the moment was right and, only then, began throwing them at zoo patrons. This shows at least a rudimentary ability to understand and plan for the future. Who is to say that wood apes cannot, or do not, do the same? In March of 2012, I wrote a blog post about a captive gorilla that featured a large silverback throwing a piece of sod at zoo workers in an adjacent enclosure. In the video, the big male casually makes his way to an area where the turf in his enclosure is loose, digs out a piece and then quickly moves toward the workers using his momentum to make a powerful overhand throw. The thing that really struck me was how the gorilla threw the sod. To say it was a true overhand throw would not be accurate but, to put it in baseball terms, it was at least a three-quarter motion. To see a non-human primate throw an object in a powerful overhand manner is pretty special. Skeptics have argued that only humans can throw objects in such a way. This video would seem to suggest otherwise. While the silverback’s motion is not as fluid as that of a human throwing a baseball, he effectively uses a running start to build momentum and, thus, gain velocity on his throw. What if, instead of a piece of sod, this gorilla had hurled a baseball-sized rock? Said rock would be capable of injuring a human or making a very loud noise if it hit a structure like a corrugated metal roof. Note, too, in the video how the gorilla makes his throw and immediately flees in an effort to avoid detection. Clearly, in this video the workers in the adjacent enclosure know exactly who threw the sod at them but, if a similar incident were to occur on a heavily forested mountain slope, similar to the NAWAC’s main study area, it is entirely possible the guilty ape would escape detection. After all, when a person hears a loud impact, such as a rock striking a structure, he or she turns their head to look at the area where the impact took place. Only after doing so will a person turn to look back at the area from where the projectile might have originated. This small window of time would be enough for even a large animal to retreat safely out of sight. The title of this post is a bit misleading. I do not believe the Ouachita Project Monograph needs defending. It is a meticulously detailed and scholarly work of which I am very proud to have had even a small part in producing. The events documented in it all really happened. Those of you who have an open mind when it comes to the possible existence of the wood ape, or sasquatch, but doubt some of the content of the OPM need only to do a little digging on your own to find countless examples of similar behaviors reported over the years by people claiming to have had a bigfoot encounter. Too, it is easy enough to look into the current research on known great apes and find similar behaviors to those recounted in the OPM. Nothing documented therein is outside the realm of known great ape behaviors. 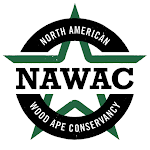 For those of you who do not believe wood apes could possibly exist, I invite you to download the OPM from the NAWAC website at no cost. Not only can you download the entire OPM, all 200+ pages of it, you can listen to audio of rock strikes captured during our research in Area X. Go, read and listen. It is worth the time. Colyer, Daryl, Alton Higgins, Brian Brown, Kathy Strain, Michael Mayes, and Baron McAndrews. Ouachita Project Monograph. Vol. 1.1. North American Wood Ape Conservancy, 2015. Print. Bindernagel, John A. North America's Great Ape, the Sasquatch: A Wildlife Biologist Looks at the Continent's Most Misunderstood Large Mammal. Courtenay, B.C. : Beachcomber, 1998. Print. Meldrum, Jeff. Sasquatch: Legend Meets Science. New York: Forge, 2006. Print. Mayes, Michael. "Chimp Plans Attack on Humans." Texas Cryptid Hunter. Blogspot, 9 Mar. 2009. Web. 11 Aug. 2016. Gorilla Pranks Zoo Workers. Gorilla Pranks Zoo Workers. NFO's Channel, 18 Mar. 2012. Web. 11 Aug. 2016.